MANDALA MAN Daivd Knight channels his travels into his music. MUSIC should not be easy. It should be something that you put your soul into, and sometimes it's a painful process," says David Knight. The San Jose singer/songwriter has, over the last year and a half, transitioned through the breakup of his former band Day One Symphony and come out on the other side as a strong solo artist, all the while with music guiding his path. In his solo endeavor, Knight performs on an array of instruments, including guitar, dumbek (a Turkish drum), kalimba (an African thumb piano), keyboard and djembe (an African drum) and also incorporates electronic aspects such as looping and morphing and blending vocals and random sounds. "I try to grow ... the productions of my music out of the organic things I do with instruments," Knight explains. "I still think that being able to play something or to sing, or even to manipulate a tool, whether it's a synthesizer or a program, those things are very important." The end result is much like Knight himself—a churning mix of thoughts, emotions and calm in musical form. 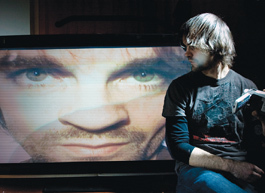 Knight's sound borrows from a variety of cultures and experiences, with glimmers of his past as the lead vocalist and guitarist of ambient-rock act Day One Symphony, as well as influences from his collaborations with local avant-garde groups Panthelion and Polyluv, and a touch of the future by way of his electronic experimentation. In large part, Knight gained his recent musical and personal confidence through an opportunity to perform in Malaysia last July, thanks to a plane ticket from a friend who lives there and a tour planned mostly by another friend from the area. Soul wide open, Knight described his month overseas as "a mind-blowing experience"—first attending "some wild world music festival in the jungle" in Borneo and later performing a stint in Malaysia, making a new group of friends in the process. "It changed me for sure. I didn't come back the same guy," he says. "I think I was a little bit unsure of myself before I left and a little reluctant to accept myself as a solo artist, and when I came back I was very much empowered—had a lot of energy and I just immediately started recording music." Knight's eye-opening look at another country's take on music, as well as its means of receiving and sharing songs, prompted him to forgo recording a full-scale concept album and to focus instead on disseminating music in the form of self-recorded, web-only tracks in four-song bites—a serial EP in three parts, available to the public via free downloads and MySpace audio streams, titled Mandala. In Sanskrit "mandala" means "having essence" or "completion," and mandala images are concentric diagrams used in Buddhism and Hinduism for meditation and in other rituals. For Knight, the name Mandala stemmed from craft art he made as a child: the simplistic act of weaving different colored strings around popsicle sticks to create patterns. "I came at the Mandala project as sort of an in-the-moment spiritual quest, because it's very difficult to churn out three to four tracks in a month's time," Knight says. In reality, though he released Mandala Part I on Dec. 1 and Part II on Jan. 1, with Part III due Feb. 15, he has more like 20 days to create, record and refine the songs for each EP. This hasty process has forced Knight to release some of the stress of perfection he's placed upon himself regarding his music, allowing him to relax and enjoy the process of creation and creativity. "That's what I interpret from the mandala—validation," he says. "I'm just going with what I feel at the moment and let that go into the song." Some songs on the EPs stem from Knight's past; others, such as "Moon Song," were written in Malaysia; and the remainder were born during the recording process. Knight says that he has taken to extreme experimenting, including using an egg beater and toothbrush on various percussion instruments. "If you're really focused on making something unique, the tools are there," Knight figures. "You just have to find out what tricks to add to your arsenal—what influences to pull in to create something unique." Knight is currently working on the third installment of the Mandala trilogy and building his arsenal, sussing out new sounds through programming and bringing new instruments into the mix. His trip to Malaysia continues to play a role in his music and his writing process: "The experience was so different for me, so unique, so beyond my comprehension that I dropped a lot of my pretenses. In Malaysia I was doing just stupid things, like writing a song that day and performing it that night. ... So I kind of got over a lot of my sensitivity and insecurity about putting out music and having it be a bit raw." His stage shows can be a bit raw, as well, as Knight chooses to strip down his works rather than "do karaoke," because he believes that the recorded tracks are a separate entity and more conceptual than his organic style of performing. Instead, his live shows focus more on cover songs and variations on his recorded tracks using alternate instrumentation rather than attempting to re-create his studio sound. "The recording is like a painting," Knight says. "I'm not trying to do reprints of the painting." DAVID KNIGHT performs on Friday (Jan. 16) at 7pm at the Venue, 4 New York Ave., Los Gatos; all ages. Tickets are $10. (www.myspace.com/pinupproductionssj) Following the performance, Knight plays at the Melt Yo' Face Off reception at Kaleid Gallery at Fourth and San Fernando streets in downtown San Jose; free.